DEDICATED TO INTEGRITY, PROFESSIONAL, EXPERT SERVICES; BOULDER HILLS LANDSCAPING SEEKS TO ENRICH THE LIVES OF OUR CUSTOMERS THROUGH PROVIDING THE HIGHEST QUALITY EXPERIENCE FROM CONCEPT TO COMPLETION, WHILE BUILDING RELATIONSHIPS AND OUR REPUTATION FROM THE INSIDE OUT. Boulder Hills Landscaping Inc. began as offering hometown landscaping and lawncare services in River Falls, WI and landscaping in Hudson, WI. Taking pride in providing a superior service for a price that was affordable for all, service grew as word spread of our commitment to outstanding customer satisfaction by providing an exceptional product for an exceptional price. Today the BHL Company serves all of the metro area, landscaping from River Falls and Hudson WI to Plymouth MN, yet stays true to the small town character of integrity and personability, creativity and care that sets us apart. We are an accredited "A+" rated business with the Better Business Bureau of Wisconsin, member of the Minnesota Nursery Landscape Association, member of the River Falls Area Chamber of Commerce, St. Croix Valley Home Builders Association, Wisconsin Builders Association, a featured service provider with an "A+" excellent rating on Angies List and nationally certified through the National Concrete Masonry Association and Interlocking Concrete Pavement Institute. We staff degreed horticulturist and employ certified onsite supervisors with a total of over 30 years landscaping experience. When hiring Boulder Hills Landscaping Inc, you are hiring a credible landscaper with a reputation to uphold. Our credibility, and the reputation we have developed with our customers and affiliates, will be evident with our professionalism and our craftsmanship. When it comes to integrity of charactor and product, we will not compromise! The design staff and installers at the Boulder Hills Landscaping Company of River Falls are experts in creating for their customers the ideal design and build hardscape or softscape, utilizing the most current trends in landscaping, that will encompass all customer desires and exceed all customer expectations! Employees of the BHL Company are properly trained and skilled craftsmen whom really take pride in their craft! This will be visible as you watch the attention that goes into every aspect of installation, from the time the truck is unloaded to the sweep and clean up at the end of each day. The Boulder Hills Landsacping Company of Hudson/River Falls installation crew work with the utmost integrity and respect for the product and the customer. Our commitment to exceptionalism is not exclusive to our installations. The Boulder Hills Landscaping Grounds Management division (GRASS MASTER LAWN CARE & GROUNDS CONTROL LLC.) provides superior lawn care services in River Falls and Hudson, WI. We aim to be superior in all aspects and we accomplish this by really caring about how your property looks!! We have a devoted, enthusiastic approach to quality and attention to detail that sets us apart from the competition. Please visit our Maintenance page to view the wide list of quality oriented and affordable lawn care services in the River Falls and Hudson, WI area. Here at Boulder Hills Landscaping Inc. we really emphasize the importance of communicating with you every step of the way to fully understand what it is you desire most out of your landscape. We then use state-of-the-art computer aided design software to construct a planview, 2D or 3D visual description of your landscape wishes. You will be able to witness precisely what your project will look like upon completion before we even begin! Your Boulder Hills Landscaping Project Manager & Landscape Designer will have a very attentive ear to your landscape wants, and once a design is agreed upon; with expertise, care, and an acute attention to detail, our professional team will create the landscape of your dreams!! Boulder Hills Landscaping Inc. guarantees customer satisfaction on all projects we undertake, as well as a "savings return" to our customers! If you ever have concerns about your installation, please do not hesitate to voice your concern. We stand behind our product, not only with honor and integrity, but also with a written warranty!! A 3% finance charge may be applicable for credit card payments. LIABILITY INSURANCE AND WORKMANS COMP VERIFICATION ARE AVAILABLE UPON CUSTOMERS REQUEST. Joseph Moelter is the owner of Boulder Hills Landscaping Inc., as well as the Lead Designer, Project Manager and even a Crew Member, all-in-one! What this means is when hiring the BHL Company, your getting the owner of the company working with you from start to finish on your project!! Joe is an NCMA & ICPI Certified Installer, with over 15 years experience in the field, and a devoted passion for softscape and hardscape design and construction. A farm boy, born and raised in River Falls, Joe developed a respect for hard work at a young age. Growing up amidst a family business, Joe also recognized the value of one's name and personal integrity that must be attached to everything he produces to truly take pride in his creation and become successful in the community. From business to family, Joe adheres to that agenda. On the job, Joe's enthusiasm and attention to your project will be exuberant from start to finish! Even after completion, it has become a common practice for Joe to routinely check up on past work over the years following to ensure you are enjoying your landscape as much as you did the day it was completed! No matter how large or how small the scope of your project, it will be visibly evident that Joe treats your job like he is creating it for his own personal enjoyment! "I had a customer tell me once that I 'put too much emphasis on the little details for a strip of edging in the ground'. I told him 'if I care this much about your edging, you should see the care I put into my stone work!' Bottom line, I aim to set a standard that will someday be noticeable to people whom really care about the quality of their landscape installation." 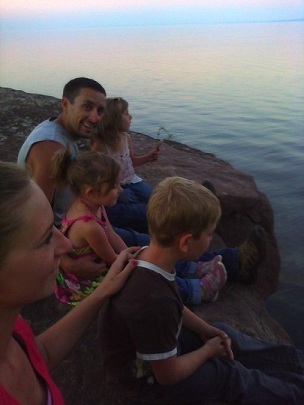 Born and raised in River Falls, Wi, and where he met his wife Jenny, Joe now spends every moment he can enjoying raising his three children, son Anthony and twin girls Alyssa and Aaliyah. 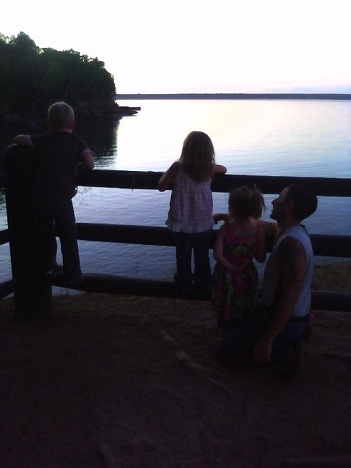 As a family they enjoy the outdoors and love to go camping in Wisconsin state parks. 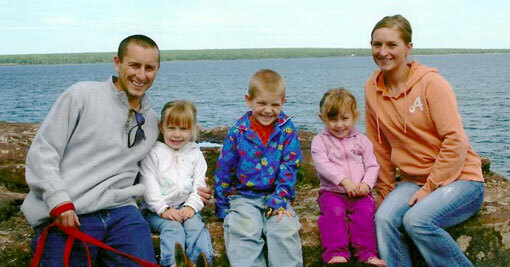 Pictured here on their annual trip to Madeline Island, Joe and Jenny express great importance on the experience for children to engage in outdoor activities and whenever possible take to the woods or water!